Some of the more interesting campaigns we saw this year drew from the political sphere to physical installations to the show's innate talents. This year, there are over 20,000 people who get to select the nominees and winners of the Emmys, and hundreds of shows are vying for their attention. In 2016, we were struck by some of the creativity that studios and networks used in pushing out the word about various shows. Things seemed more subdued on a street level in 2017, though Emmy campaign expert Rich Licata told IndieWire that the networks did seem plenty active when it came to advertising buys. Up against nearly impossible odds, there were some shows that were able to stand out, thanks to either completely rejecting the system, redefining what awards season campaigning might look like, or trying a new twist on a old favorite. Star Allison Janney, already a seven-time Emmy winner, did visit Planned Parenthood headquarters in New York with co-executive producer Gemma Baker and met with Planned Parenthood president Cecile Richards to discuss the issues which drove them to make this donation. Whether intended or not, it got at least as much attention as a normal campaign event would have. But it’s very much in the spirit of this year, which featured many examples of campaigns that weren’t afraid to invoke the current political climate. 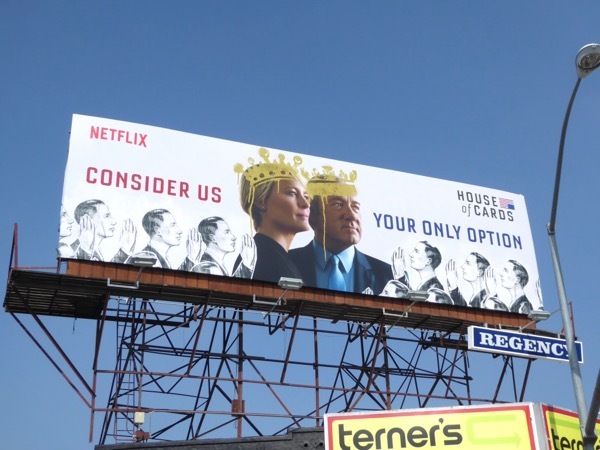 “House of Cards” also took a daring approach, with distinctive billboards that took a graffiti approach to the established key art, including posters that added crowns to the heads of Frank and Claire Underwood. Amazon and Netflix both pushed the boundaries of what an FYC campaign can look like by creating semi-permanent installation spaces featuring life-size dioramas of their flagship shows. The spaces also served as the venues for their FYC panels — of which there were many — though Netflix took the extra step of rebranding their campaigns as “FYSee” (clever). Netflix also included some fun interactivity in their set-up, rolled out during an opening night event. It included a “Luke Cage” exhibit where attendees could walk though a corridor and emerge on the other side with Luke Cage-esque super-strength, as demonstrated by showrunner Cheo Hodari Coker below. And of course, there was a photo op area where kids and adults alike could pose on the iconic bikes of “Stranger Things” — as demonstrated below by the show’s cast. …as well as the cast of “13 Reasons Why” (who look happy to appear in a show that’s not quite as heavy as their own). What Was the Most Memorable Of Them All? “American Housewife” held an enjoyable FYC event right at the beginning of the season where, instead of a screening, voters and their families were invited to the Lucky Strike bowling alley in Hollywood, where after a short panel people simply enjoyed the bowling experience — with star Diedrich Bader going from lane to lane to bowl a frame. Update: Meanwhile, the Handmaids of Hulu’s “The Handmaid’s Tale” continued their pattern of making public appearances, this time roaming around various industry locations including studios and agencies. But the most joyful and exuberant moment of the Emmys FYC campaign so far may have been one of the first events we saw this year. The panel for “Crazy Ex-Girlfriend,” hosted by the Television Academy, eschewed the traditional screening and Q&A format to bring live performance to Emmys voters. Performing eight of the original songs which the CW musical has embedded in our brains, it was one of the most interesting approaches to the Emmy campaign we saw during the initial first phase of television’s most prominent awards season. “You hear about some TV shows or movies in which the actors are very precious and afraid to take risks, but this cast couldn’t be more opposite of that. They give 100 percent to everything on this show, including this one-night-only FYC concert,” Bloom added. Whether any of these campaigns end up helping these shows score Emmy nods is a question to be answered Thursday, July 13.